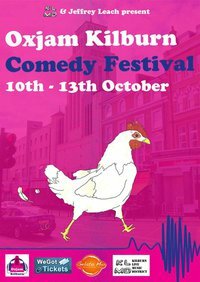 Last night, OxjamKilburn’s four-night comedy festival kicked off. Along with Friday’s fashion show at the State building, this is all building up to October 23rd’s OxjamKilburn takeover when your favourite Kilburn music venues play host to a day of live music – all accessible for a tenner if you’re quick and £12.50 if you’re not (wegottickets.com). Proceeds from all these events go directly to Oxfam. A good crowd turned out for launch night at Power’s on the High Road to see compère Jeff Leach walk us through six acts. 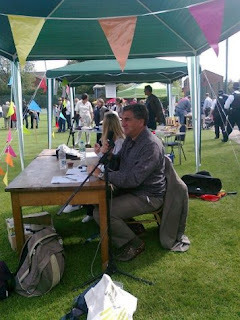 Paul Sweeney and Simon Feilder were the stand-out stand ups. I also have a soft spot for Tom Allen, who I saw at The Good Ship a few weeks ago. The evening ended up in mild farce as headliner Julian Deane got caught up in strange 1-on-1 conversations with audience members and the whole thing verged on the uncomfortable. Gelatio Mio were on hand with free ice cream – what’s not to like about that you’re thinking? What’s not to like may be when it’s thrown at Leach (playfully-ish I should add). There was a distinct mood shift after spoof band Hot Brew finished its surreal character comedy cabaret act. It was different, and entertaining, but maybe this wasn’t the right audience as most sat there in stunned silence. The comedy festival runs until Wednesday. Monday & Tuesday the shows take place at Paradise in Kensal Green with Trevor Lock and Alex Zane headlinng respectively. Wednesday’s show is at The North London Tavern where Rufus Hound and Gail Porter (yes, that Gail Porter) top the bill. Leach is on stage every night and probably justifies the £5 ticket price (£6 on the door) by himself.